Plygene gutter lining has been developed to enable an absolutely water tight and long term solution to the problem of leaking joints in Finlock Gutters. Using our HD Sharman trained staff, we will install the liner working to the method and quality expected by our customers. The liner can be supplied in almost any length giving you a seam free liner to the main runs. Corners, stop ends and boundary joiners etc. are heat welded to the liner creating a joint free lining. 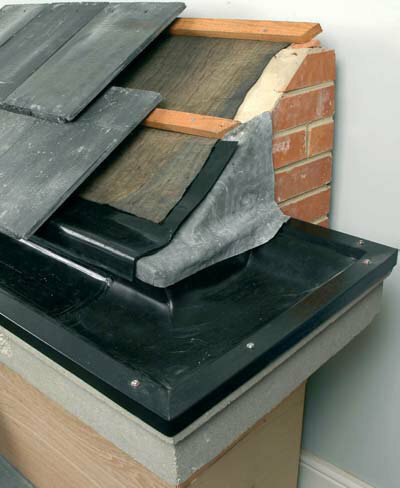 To allow correct installation, roof tiles are removed or slid back, enabling a sarking angle to be fitted under the felt, creating a new drip edge into the gutter. The liner is laid in the gutter following its contours and finished on the top of the concrete gutter, front edge. The rear of the liner is held in place by the sarking angle and roof tiles. The front is held in place with a black plastisol coated steel capping. This is screwed to the top of the gutter. This capping also gives the gutter a decorative finish. Note: The secondary liner will not correct any falls in the gutter. To maintain optimum flow of water, clean the gutter at regular intervals, removing debris and silt build up.